In this week I`ve been really busy for many reasons, so our studies have going on step by step. I´ve been also unable to print material, so we`ve tried to use another ways to learn letters etc. For letters the book Z got from sister Ummu Abdillaahi and her kids is really usefull. Only Z has already written by some colors which didn`t go away proberly, but the book is still so usefull and Z likes it a lot! Thank You again Sister! Kids love this small toy we found from Istanbul! By it can draw many different kind of shapes, in this time flowers. Z colored them and practised to write his name and letters in Arabic by the help of dots. Z`s work - quite same than which we missed on Monday. S`s work for thema "flowers". 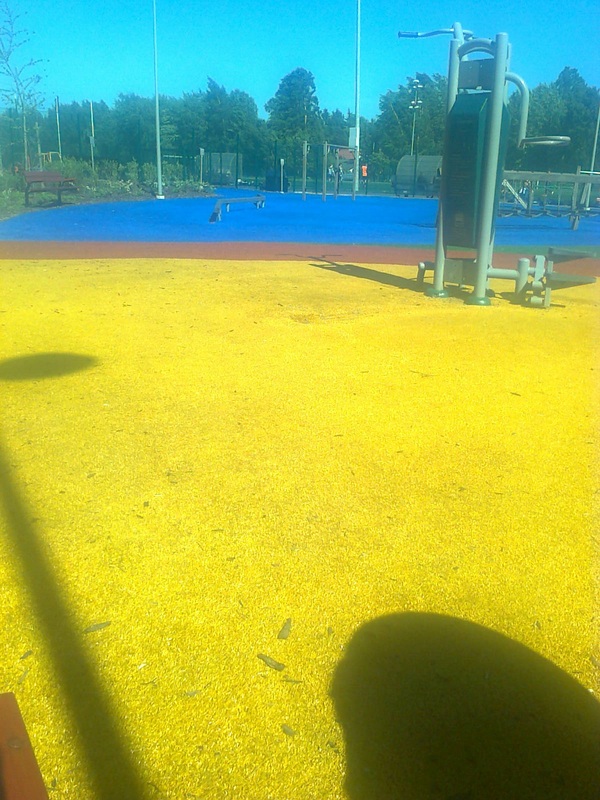 Today we went to one park where can do some sport and play. It was fun, but I didn`t take camera with me. I took only one picture by my phone :). S brought for me again some rhubarbs and I made dessert from them. Rhubarb should be eaten with milk products, so we added cream. Like in my childhood :)! We continued this S`s Arabic book with Z. And this one. This is meant for older kids, not for Z`s age, and because there are no pictures it`s little boring for small children, but we only checked some letters. And I wanted to introduce this book too, because for older kids it`s good! Z took one picture by my camera and when I opened the pictures I thought "What is this?!". But it`s taken from the book`s cover. And so beautiful I added also here :). Our experience by Montessori toys. I had to buy already new street chalks, because kids have used them a lot! These are good idea in the summer and can be used for educational way. From Saiturinpörssi can find cheap price. For Ramadan I`ve started to plan a calendar for kids. I decided to do a really simply one, bacause of my rush. I used 30 baby food bottles. Inside them I just putted small piece of magazine paper. After I add numbers on the covers inshaaAllaah. I think they come quite cute, even I made them really fast. At least they were easy to make and cheap or even free :)! I wanted to do an own calendar for K, S and Z, but then I should have 90 presents, so I think, I`ll do only this one and let them open the bottle on their turn. I added the first letter of child`s name, whose turn it`s open the bottle under the bottle: For example 1 Z, 2 S, 3 K, 4 Z, 5 S etc. Then it`s easier to remember whose turn it is and also to plan a proper present! My idea is to put inside the bottles small presents (like small toy, stickers, candy, coins etc.) and islamic questions or tasks for every day. I hope that in this way kids learn something in nice way! I made one time a really simple ramadan calendar for my kids and they loved that and already asked me, do you make like that for us in this year too. Here are my questions. They are about the five pillars of Islam, about our deen, about al asma al husna and of course about Ramadan. Questions are also like our subjects of each day. For Ramadan I found a nice book for Z from here . And here is another one, which I`ve used before with kids. Today Z had fun time: he practised to drive by scooter alhamdulillaah. Now he studies Quraan with his dad :). InshaaAllaah tomorrow we`ll meet in the park with sisters and kids! Assalamu alaikum wa rahmtullhi wa barkatuh.